I chose this picture out of the 360 pictures she sent because it is priceless. This was taken from the living room of our house on Portland Avenue. I'm guessing the year was 1971 or so. The picture says so much about the time and situation we were in that it needed to be described. 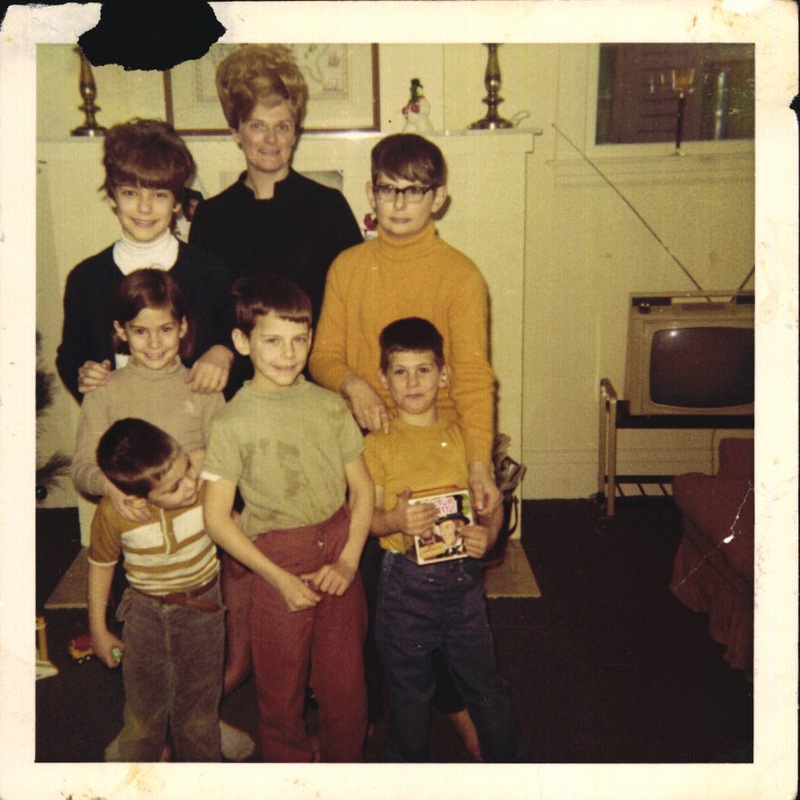 The great thing about this picture is it is all of us together, six kids and mom. We don't have a ton of picture of us all together, especially impromptu, like this one appears to be. Most of us are smiling, happy to be in our new house. The rental place was small, in a less desirable neighborhood where, when the winds were just right,your neighborhood was overwhelmed by the smell from the coking plant across the rail yards a few blocks away. This house was gargantuan in comparison, with four bedrooms, a full basement and walk-in attic. Despite what the picture says about our happiness, it speaks to so much more. If you look at my shirt and wonder "what's with that?," you're not alone. It is questions like that that my mom confronted every day as a single parent. Imaging trying to keep the lid on with 6 kids with only a 10 year difference between oldest and youngest. Yikes! I get itchy thinking about it. I think things like my shirt being a stained mess just kind of rolled off mom after a while. If we weren't bleeding, or on fire, or have a broken bone protruding from our skin, we were passed over for more immediate crises, like making sure we had milk for our cereal or that the furnace pilot light was lit. My cousin said the picture was actually the "Original Dirty Shirt". I like that. It makes me wonder too what my mom had to deal with on the day this picture was taken. A missed school field trip payment? An expensive car repair that had her robbing Peter to pay Paul? An appliance on the fritz? Again, I'm starting to get itchy just thinking about it. But on top of all of that, if you look at the energy of this picture you get a good feel for the reason she often went from work clothes to pajamas/nightgown immediately after dinner. It's called exhaustion. None of this is to say that she didn't love every minute of raising us. Because we were never given the impression that we were anything more than loved completely and fully. But when it comes down to it, we were still a lot of work. Going down the line you have Paul on the front left, completely distracted by heaven knows what. Rob seems to be very happy with his Willie Wonka Jack in the Box. and me with not only my shirt and pant tucking issues. Jane is smiling away in the middle row, a happy grade schooler. Tom across from her looking all older-brotherly and serious. Notice he has two hands on Rob, likely to keep him still and in-place. And in the back row you have Pat in her early adolescence with all of its hormonal changes and the fun that goes with it. She was the mom when Mom wasn't around, and never let us forget that. And in the back in the beehive is mom. The beehive was high maintenance, redone once a week with a "comb-out" midweek, whatever that means. Every night she'd wrap the hive in a toilet paper with a hairnet thing over the top. I don't know what the toilet paper protected the hive from, but hey, look at my hairline. Maybe she was on to something. Throw in a rabbit eared black and white TV and a couch that is on it's last legs (and luckily, not in the picture too much) and you get a feel for single parent life in '71. All chaos, all broken, all loving and all good. And I'm blessed to have been part of it.